Effective in all black powder firearms, Black MZ™ is a black powder replacement designed for hunters, Cowboy Action shooters and re-enactment enthusiasts. 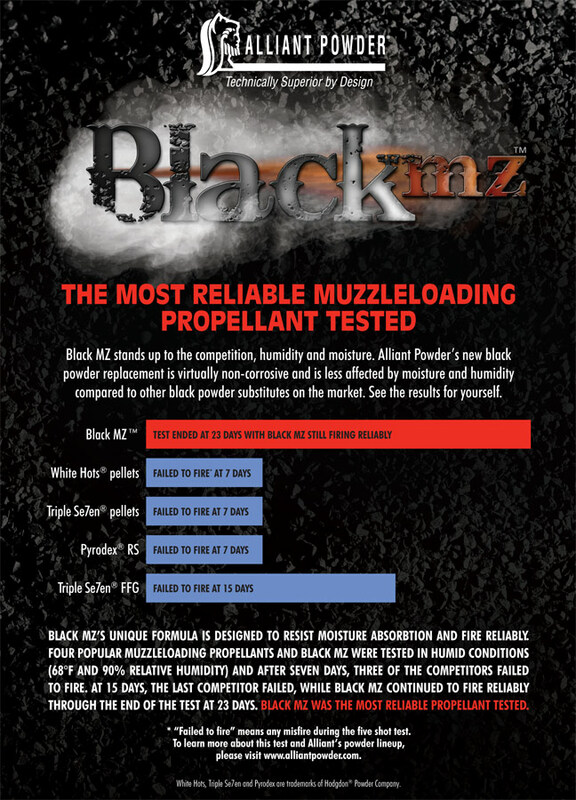 Moisture resistant and virtually non-corrosive, Black MZ replicates black powder performance without the ignition headaches and cleaning hassles common to traditional black powder use. Our experience through testing and hunting has been that best results are attained in the 50 caliber muzzleloader using 90 grains volumetric of Black MZ with sabot bullet weights of 240 grains to 260 grains. Make sure that the barrel is clean and totally dry (swab barrel with dry patches until there is no evidence of moisture). Black MZ functions best when heavily compressed by the seated sabot. If you need further help or information please contact us at 800-276-9337.